Are you expecting and wondering how your new baby and your pet will get along? Well first of all, "congratulations"! Secondly, "don't panic"! Thousands of households every day bring baby home to meet the pets and it all goes swimmingly! Remembering a few simple things will also help ensure that the first time baby meets your dog or cat will go as smoothly as possible. Your first step is to consider a series of obedience classes before the baby arrives, especially if your dog doesn’t know the basic commands: sit, come, stay. When teaching the ‘leave it’ command, rather use the word ‘mine’, as this word is commonly used by toddlers. Also, take bite prevention exercises. Even if your dog is perfectly trained not to bite, do this training again, just in case. Also prepare your pet by preparing your nursery and you should get on to this at least several weeks before the baby is due. For hygiene and safety reasons, the nursery should be a 'pet free' area -if you have curious pet, consider a self-closing screen door to keep pets out. Or you might want to consider installing a motion sensor to the nursery door to alert you if one of your pets enters that room. Renovating the nursery might be enough to make your pet anxious so try and give your pet time to adjust before baby arrives. It's important that you're aware that pets can sometimes transmit diseases to babies but, in reality, serious diseases are rare. Some Bacteria, worms and other infectious agents can be transmitted to children from pets and some diseases are transmitted from infected cats to the unborn child. The bacteria that pets can share with babies mostly cause abdominal upsets. Worms transmitted from pets to children can cause muscle, joint and abdominal pains, neurological disturbances and even blindness and the fungal skin infection, ringworm, is another potential problem. Lastly, if you are a cat owner, you need to be aware of Toxoplasmosis. This single-celled parasite is transmitted from young cats to unborn children via the child's pregnant mother. It can cause blindness and other problems. All the above infections are extremely rare and simple hygienic measure will stop all such problems. Don't let pets lick your baby, especially on the face and hands. Cover the sandpit when it is not in use. Pregnant ladies should wear gloves when gardening. Don't let your infant crawl in areas where your dog has soiled and remove all of your pet's deposits from the garden on a daily basis. Worm your dog regularly. Pups should be wormed every two weeks until three months old, then monthly until six months old. Beyond six months of age, every dog should be wormed every three months. Use a monthly heartworm preventive that also kills intestinal worms but be aware than none of these will kill all intestinal worms so a three monthly all-wormer is still important. If your pet is unwell, especially if it has diarrhoea or a skin disease, consult your veterinarian. When you have a baby, consider moving away from chemical insecticide rinses for your pet that you drench its coat with insecticide. The 'spot on the neck' preparations are good, but keep your pet away from your baby for at least 48 hours while the insecticide dissipates. Alternatively there are several tablet preparations that will control fleas and some that also control worms at the same time. 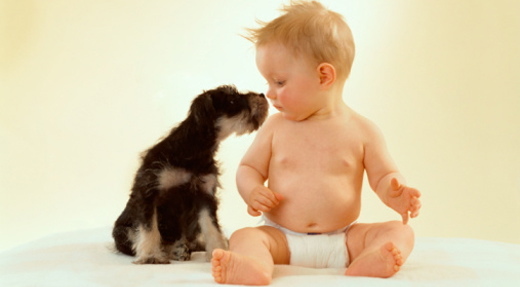 You are likely to be concerned about the effect of your baby on your pet's behaviour. When you bring your baby home for the first time, your dog and cat are bound to be curious. There are so many pleasant, and some not so pleasant, odours that are associated with babies that your pets will find most inviting. Include the various vocal arrangements that babies practice at random and your necessary distraction away from your pets in favour of the alien usurper and your pets are sure to be curious. 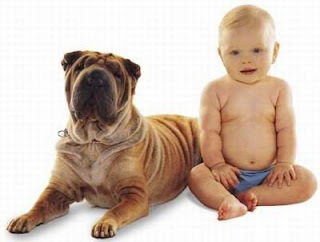 Most pets adapt very well but aggressive pets mixing with infant children are an obvious concern. Sadly, the face and head are the commonest sites of injury when things go wrong. Allow your pets to gently investigate your baby. Allow some cautious sniffing but no licking. Speak to your pets in soothing tones and massage their ears and faces to reassure them. Start with brief introductions at first and build up the duration as your pets become acquainted. Consider walking your dog and baby together. Have your baby in a papoose as managing a boisterous dog and an untrained and disobedient pram at the same time can be difficult and dangerous. Back in the home, play pens and baby gates can be used to control interactions. A play pen can confine your baby while your pets are free, or your pets while your baby is free and baby gates are very useful to allow cats and small dogs to escape from the terror toddler! It is also advisable to get your pets used to spending more time away from you before the baby arrives, as this will be the reality of your pets' future. For the last month or two of your pregnancy, leave your pets outside more often but do this by giving your pets something rewarding to distract them such as a Kong toy or Roller Treat Ball. Don't be too concerned. Most pets get on very well with new babies and nothing is more rewarding than seeing a child and pet sharing mutual love but mever leave your dog and your baby unsupervised, under any circumstances. Be extra careful when the baby is crying, screaming or waving its arms and legs. Such actions can bring out a predatory or investigative reaction from the dog. Put the dog in another room or in the down/stay position, several meters away from a crying baby. Following these simple suggestions will greatly improve the interaction of your pets and your new baby.